The Direct Commander Query Language allows you to enter complex item selection criteria, apply various conditions to the field value, and combine them using boolean operators. The search term is entered in the text filter line at the bottom of the Commander panel. A query using boolean operators begins with the = symbol. 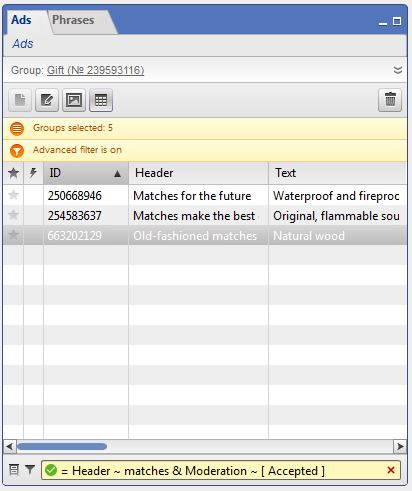 For example, the search term header ~ biscuits will return all ads that contain the word “biscuits” in the Header column. Start entering your search term following the = symbol. At the same time, in the input line the icon will appear. Field names and operators can be selected from pop-up suggestions. The input is not case sensitive. = header = "high-heeled shoes"
= header = "\"high-heeled shoes\""
For fields which can input a fixed number of values (Moderation, Status, Priority, etc. ), always use the ~ and !~ operators with square brackets, even when you enter a single value. If the search term was not correctly formulated, then the icon in the text entry line will turn and an error message will appear. You can use the operators & (boolean AND) and | (boolean OR) to form combined search terms. Search term operations are executed strictly from left to right, but the order can be changed by using round brackets. Operations enclosed in brackets take priority over the standard order of operations. 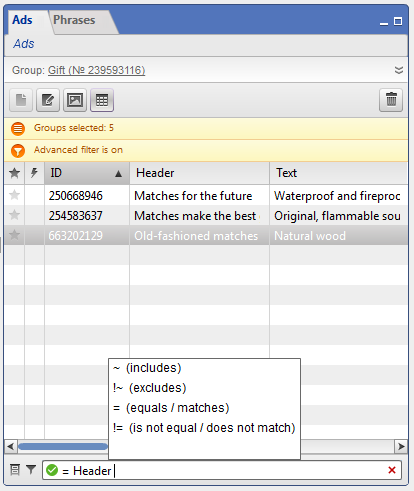 This search term will return keywords containing one of the keywords: “matches” or “sugar”. They contain either the word “matches” or the word “sugar”. The bid on search is greater than 1. They contain the word “matches”. They contain the word “sugar” and their bid on search is greater than 1. Depending on the DCQL field, the following types of operators are accepted. = Moderation !~ [Pending] The request picks up ads where the Moderation column contains any value except “Pending”. = Equal/match = geotargeting = Australia Only returns groups with “Australia” entered for geotargeting. = Number = [111111 222222] The request picks up ads with numbers 111111 and 222222. = Number != [111111 222222] The request picks up ads with all numbers except 111111 and 222222. You can only use the operators >, >=, < and <= for columns with numerical values.